A man who's accused of crashing a car into a television news van then tried to carjack the crew before stealing a police car instead is in police custody, officials said. Officers found the man late Monday morning, but have not released his identity. Houston NBC affiliate KPRC reported on the incident involving two of their journalists early Monday in the city's central business district. 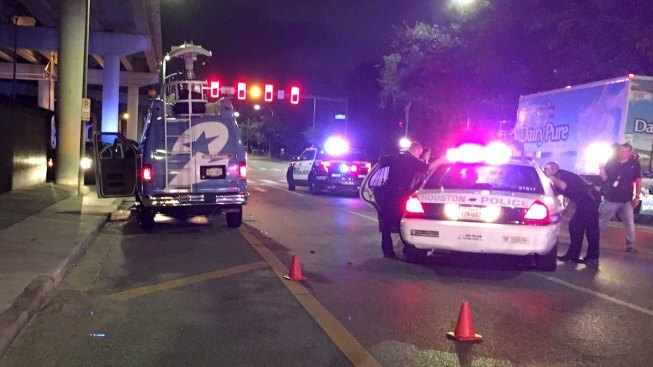 According to the report, a reporter and her photographer were on their way to cover a story about the Houston Astros and were stopped at a red light when a car sideswiped the van. "He tried to take our live truck. He tried to carjack us," reporter Sofia Ojeda said in a Facebook Live video, visibly shaken by what had happened moments before. "Two Houston police officers were nearby and they tried to help us, but he then attacked them and jumped in their Houston police vehicle and took off." Nearby police officers saw what happened and confronted the man. He argued with one of the officers and dragged her out of her patrol car before driving off with it, the report said. Ojeda's video showed the crew's live truck with damage along the passenger's side. "This is definitely something that we never imagined would happen, traumatizing and scary, but again, thank God that two Houston police officers were nearby and they jumped right into action to help us," Ojeda said. Ojeda said a juvenile riding in the back of the cruiser at the time it was stolen was later found. The patrol car was found abandoned nearby. Ojeda, her photographer and the responding officer had injuries not considered life threatening, police said.